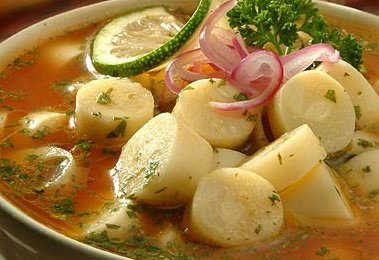 What is it: An opening dish coming from Latin America, perfect to impress your guests at home!. Become a chef for a night with this special recipe. Time of preparaction: 25 minutes. – 1 can of Heart of Palms, presentation of 1 kg . – finely chopped the follow : 1 red pepper finelly chopped, 1 branch of cilander, 1 branch of persil. – 1/2 cup (250 mL) of orange juice, 1 cup of lemon juice, 1/2 cup of ginger ale. Cut the palm in medallinos and put in a bowl. Add the lemon and orange juices, onion, cilander and persil, the mustard, kechup and red pepper. Put salt and pepper to the taste and add olive oil. Let it cold and serve.